I love red, however in the past did not wear it for fear of attraction attention. Make no mistake it will attract attention and especially when you pull everything together like the layout above. This is how to attract attention, in a good way so do not fear red - Own the color - Own the look. I have come to love red. I purchased the stripe skit from Brooks Brothers on line last week for $31.20. I had tried it on in the store last summer and loved it however, just could not justify the full price for a "not wear every day" piece. Through three season now I have been watching it on-line and last week ordered. From seeing and trying it on in the store, I knew the material, length and correct size. It likely breaks all the rules with stripes going in two direction but the A-line cut makes it work. As described: "A-line skirt mixes vertical and horizontal stripes to create a figure-flattering illusion." It is short (above the knee) so is youthful and needs to be paired into a casual look. Perfect for a "ladies that lunch" or afternoon nigh-tea. The only other new item in the layout is the Style & Co Paycee Two-Piece Dress Sandals from Macy's. This weekend I found on sale for $37.93. Just the right height (2 1/2") for shopping and being out all day. 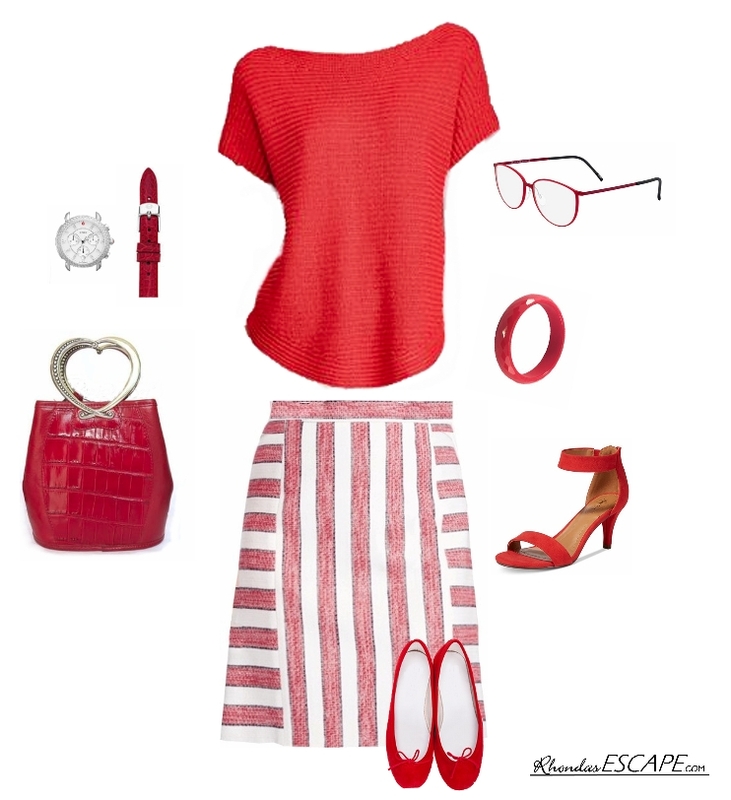 ESCAPE in red for this spring!